There is perhaps no more popular poster artist today then Alfons Mucha. This Moravian genius was born in Ivančice, Moravia (now part of the Czech Republic) in 1871. Studying art and music from an early age, he made his way to Paris in 1887 to continue his studies. Laboring in obscurity he survived by producing illustrations for magazines. In 1894, happenstance intervened and propelled Mucha to stardom. The great actress Sarah Bernhardt was opening her new play, Gismonda, in a few weeks and discovered that all her regular artists were on Christmas holiday. In desperation, her printer turned to the young Mucha who created the poster and Art Nouveau in less than a week. Bernhardt loved the poster and immediately signed Mucha to a six-year contract designing posters for her plays. The French press originally described the work as Mucha’s Style, but everyone else labeled it Art Nouveau. Gismonda and the Bernhardt posters that followed made Mucha a sensation. 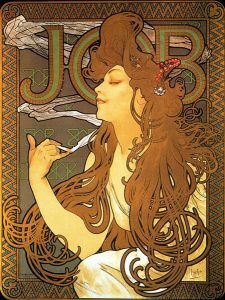 From this one poster sprang a wide variety of artwork that was the essence of Art Nouveau. In addition to his posters for Bernhardt, Mucha became famous for his art panels, vertical posters themed to nature, such as The Seasons and The Times of the Day. All featured beautiful women, with long flowing hair often in ethereal settings. He was in such demand that he designed posters for cigarettes, cookies and beer. Even today, cookie tins with Mucha artwork often fetch $1000. Mucha was more than a posterist; if you visit his museum in Prague (well worth the trip) you’ll see one panel from his Slav Epic, a series of oversized paintings telling the history of that race. (The rest are a few blocks away in the National Gallery.) You’ll also see the currency and stamps he designed for the infant country of Czechoslovakia after World War I, and in Prague castle you can see his stained glass panel in St. Vitus Cathedral. Mucha’s posters always bring thousands of dollars in the auction world. His work is so highly coveted that dealers rarely keep any image on hand for very long. 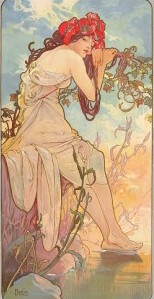 The good news is that Mucha’s come to market quite often, and for the right price can be yours. The Indian River Poster Company can help you to acquire the works of Mucha.